We cannot express how much Smile-A-Mile has meant to our family!! Gabriella was diagnosed July 2015 and was in patient several times during her journey. During the Hospital Outreach Program, SAM was there to play BINGO with us, to entertain us, and just help take our minds off of the fact that we were stuck in the hospital with a sick child. 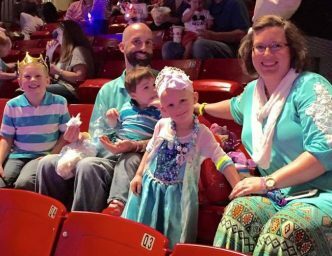 Once Gabriella was feeling better and able to get out and about, SAM sent us to several functions including the Circus, AL vs AU gymnastics event, and Disney on Ice. We cannot express how much it meant to us to be able to take all of our children to an event and not have to worry about the price of tickets. We were able to get out and just enjoy being a family. We cannot express our gratitude enough! !